When we start a website on wordpress platform for blogging or else, we need a uniquely designed theme for our site. 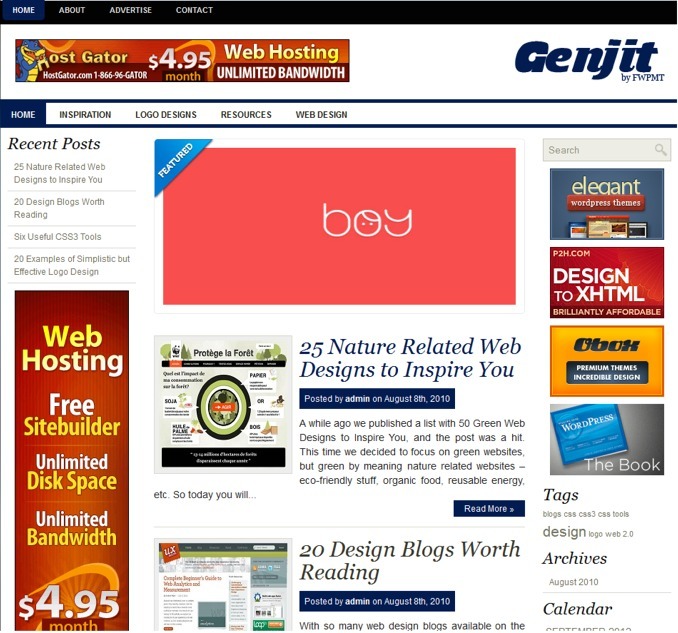 Site layout is crucial for any site to get visitors attention and if you want your visitors to visit your blog frequently then definitely you need a unique theme for your blog. You need a template/layout with following features; Responsive and Easy to understand layout, Easy Navigation, Color schemes must be eye’s friendly, SEO optimized, Mobile optimized, etc. 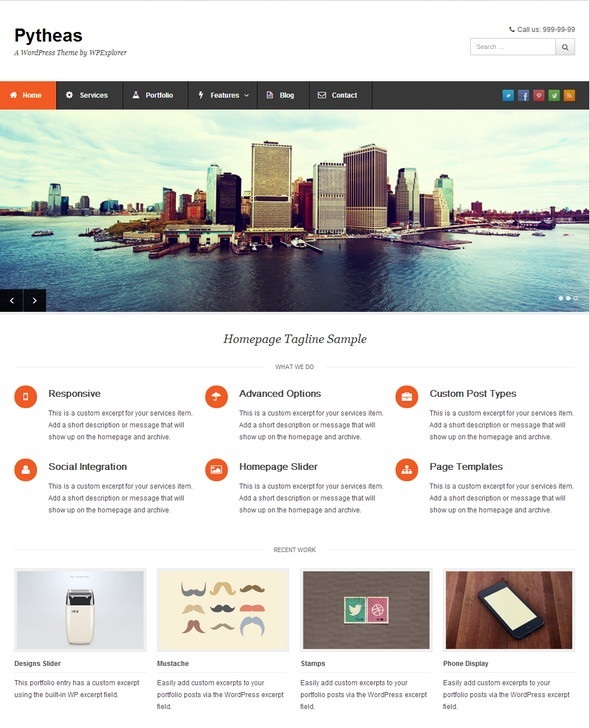 Here, we will show you some best responsive wordpress themes. You can download these themes easily without any problem. These layouts are premium, but you can download these free of cost and also these are responsive, SEO optimized and ads ready. 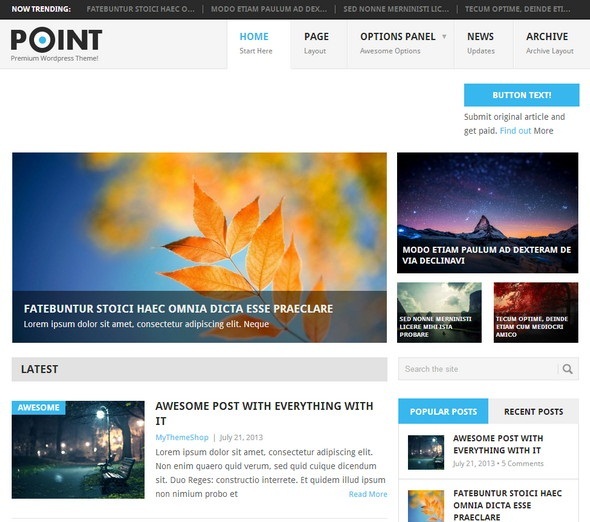 “Point” is developed by MyThemeShop, its 100% free and support full premium functions like Responsive, SEO optimized, Friendly layout, Ads management panel, HTML5, CSS3 and also related posts option activated. You can choose multi-layout options and color schemes. 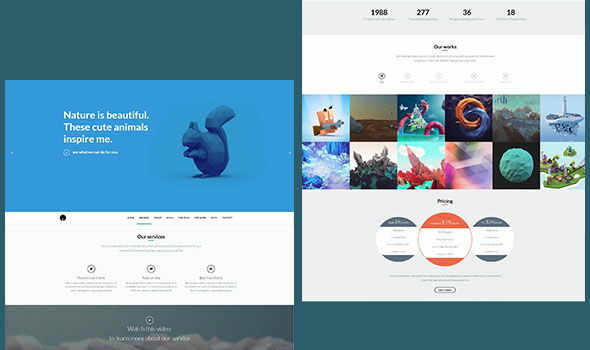 Designfolio is a modern WordPress template for designers and creatives. 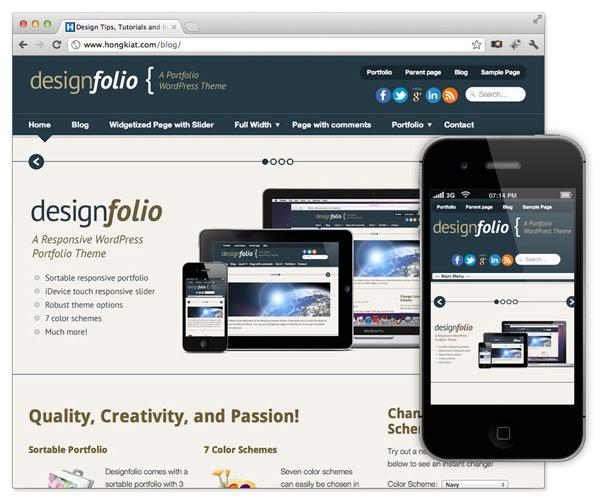 Responsive on all screens sizes like tablets, desktops, and smartphones. 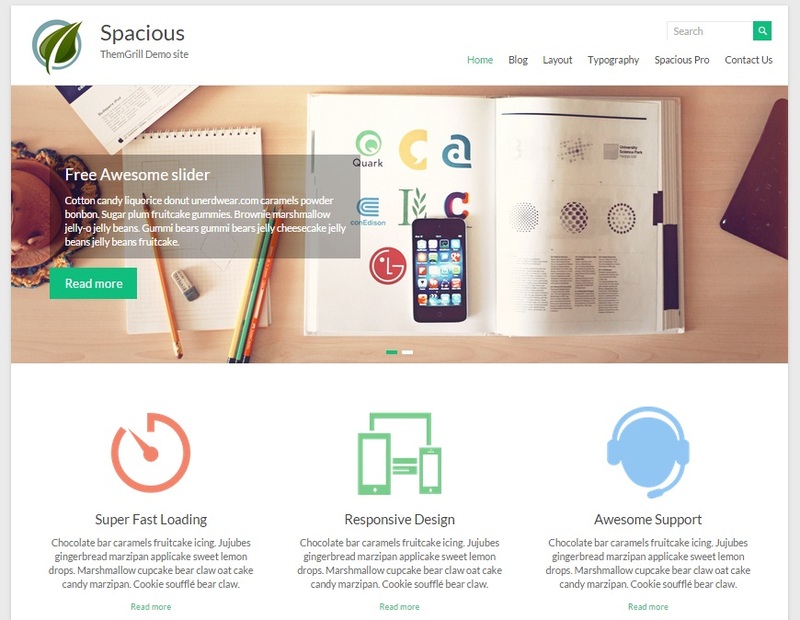 Spacious is one of the most beautiful, responsive, fast loading optimized, simple color scheme, seo optimized and clean clear wordpress theme. Spacious have just great layout for blogs or website. Theme Grill develops this theme, and the current number of downloads are 115,752 till-to-date and counting. 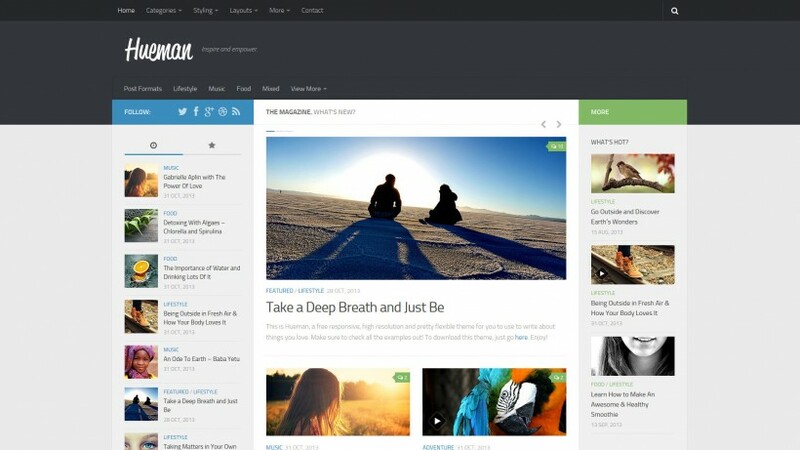 Hueman is a free magazine style theme for wordpress blogs. It supports two sidebars left, two sidebars right, slider, typography, multi layout styles, social buttons ready, custom footer and header. The unique color scheme makes Hueman an excellent design. Another one best WORDPRESS template, Unique white and orange colors combination make it just awesome. Rohit Tripathi is the author of Sixteen. 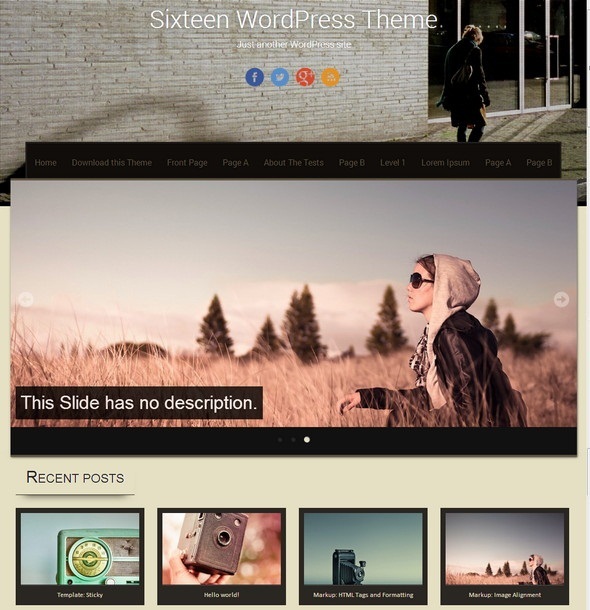 Sixteen is a responsive and an artistic theme and also having these features; slider panel, grid layout for the homepage, customize-able header, and footer, mutli-language supported makes Sixteen suitable for blogs. 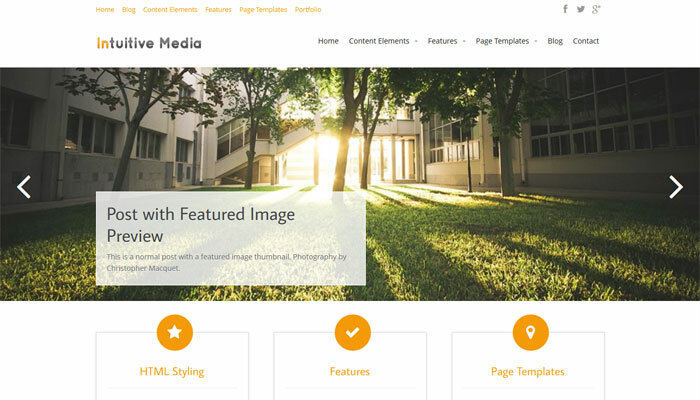 Pytheas is an awesome theme with the main features like responsive design, social icons options, awesome fonts, slider, portfolio sliders, SEO breadcrumbs, widget sidebar and footer, full width template and also built-in options panel. 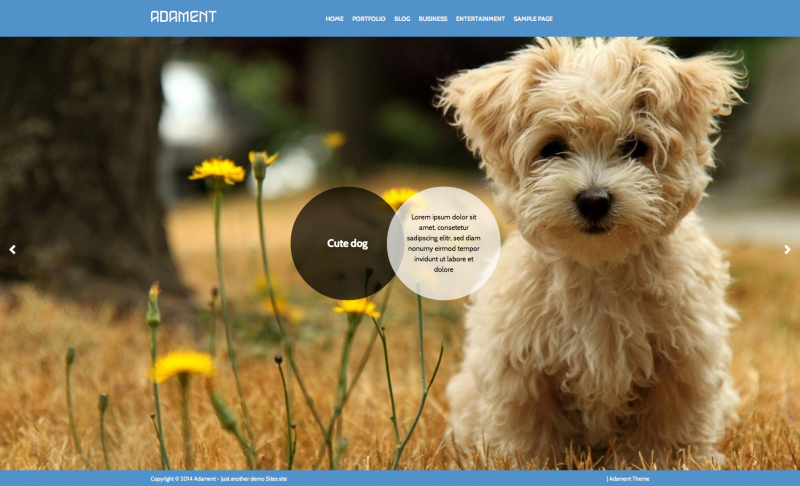 Attitude is a free responsive, simple, clean and retina ready theme. Also, Attitude has premium features like 5-page layouts, five layouts for every post, favicon, header, custom background, CSS, custom logo, breadcrumb ready, easy navigation panel, contact form 7 supported, translation ready, 10+ social icons and many more. 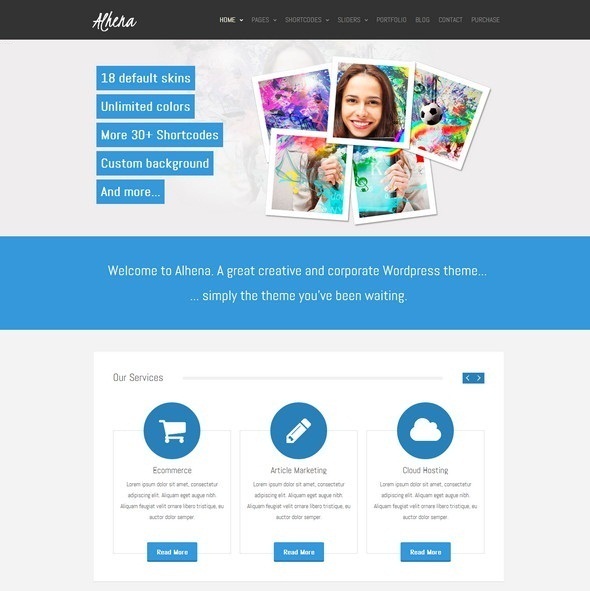 Alhena is a responsive, clean and simple wordpress template. It supports almost all web browsers and also uses HTML5 and CSS technologies. 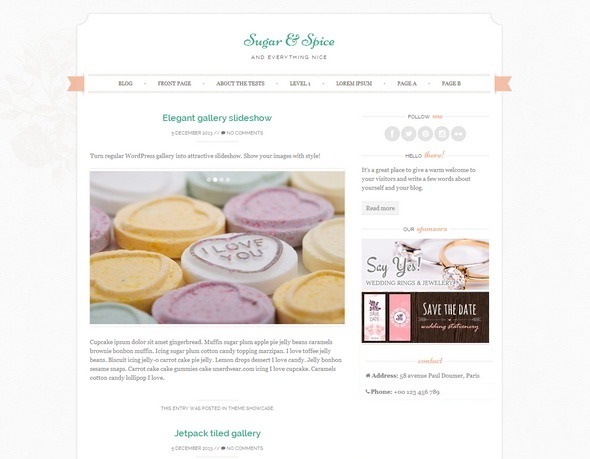 Sugar and Spice are chic, feminine and wedding template for wedding blogs. 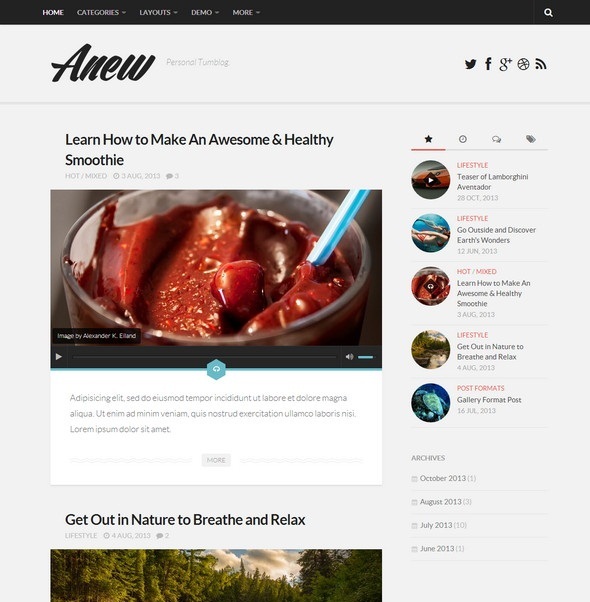 You can upload your custom logo, favicon, 3 different blog layouts, customizable colors and also responsive too. 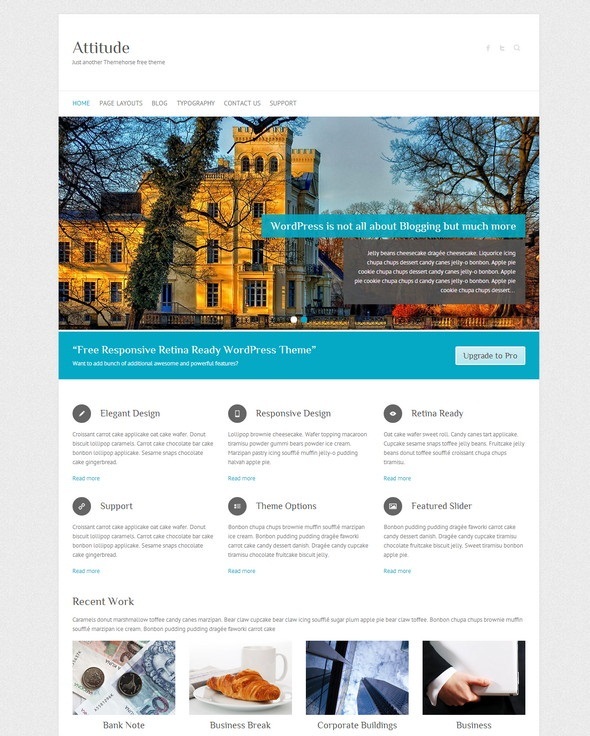 Clean Responsive is mutli purpose theme with magazine/blog layout, slider, introduction text, responsive display for desktops, smartphones and tablets. The slider of this template is brilliant flex. 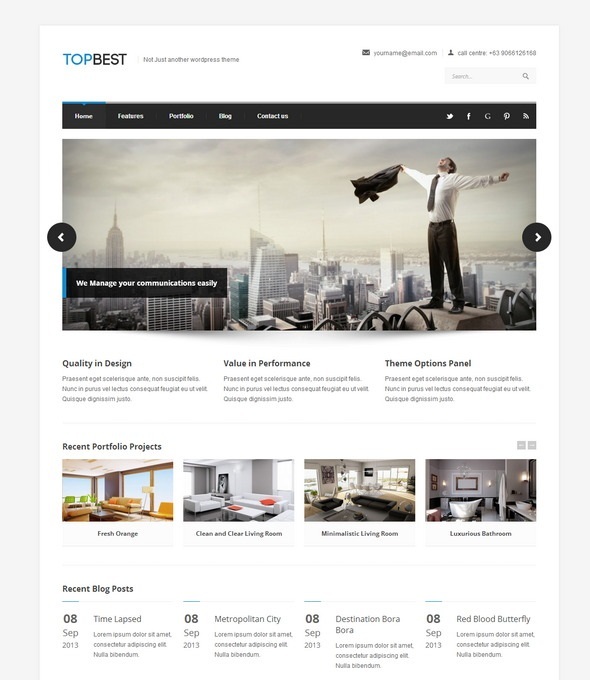 TopBest is another responsive wordpress theme with following features shortcode plugin by wordpressexplorer.com, smart panel options, 5 multi homepage layouts, portfolio gallery with 4 different layouts, sidebars and more. It is responsive, translation ready, eight layouts including magazine and blog, 40+ social icons, top bar customizable, available in 16 different color schemes, 10+ widget areas, excellent fonts and a lot of more. 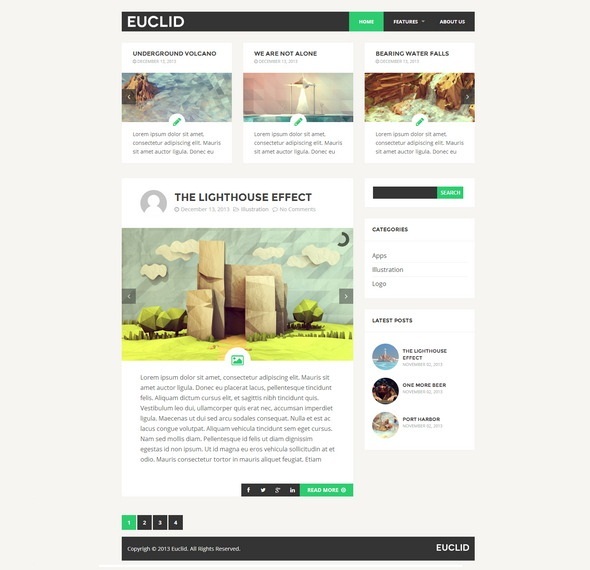 Euclid is a blog template for wordpress, it is flexibles So, we can turn it in various styles as per need, it’s free, smart panel theme options, 300+ shortcodes, six color schemes, custom widgets, post options, etc. This template is just great due to its layouts, fast loading speed, responsive, flexibility, simple layout builder, 60 plus animated effects, smart carousel, parallax background, ajax contact form, 600+ Google fonts, and unlimited color schemes. Dazzling is a free, responsive, retina display ready, flat design, featured slider infinite scrolling, unlimited colors schemes, excellent fonts, WooCommerce integration and also translation ready theme. Dazzling is a unique template for blogs. 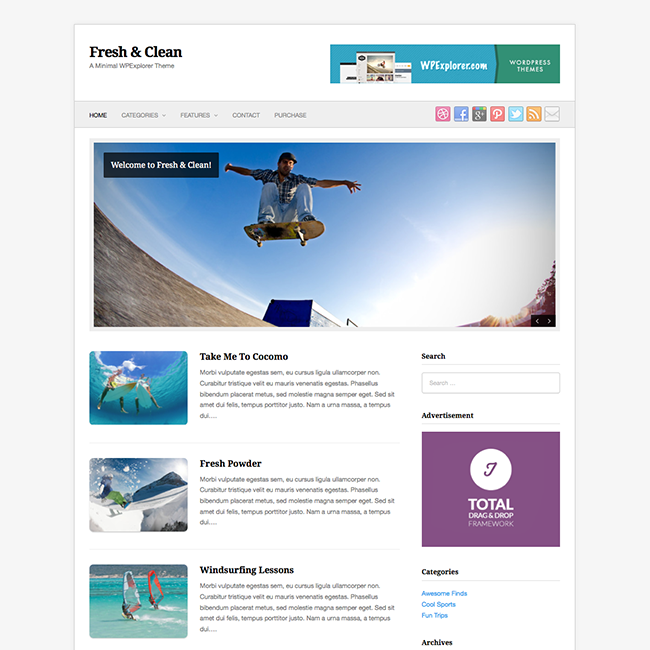 Fresh and Clean is a blogging theme having features Responsive, Retina display ready, Custom footer and header, Featured widgets, CSS, Clean & Simple and Optimized code, Header banner spot, Custom logo, Favicon and fast loading theme. Adament is responsive design and built-in bootstrap feature, you can change color schemes for this template as per your needs. 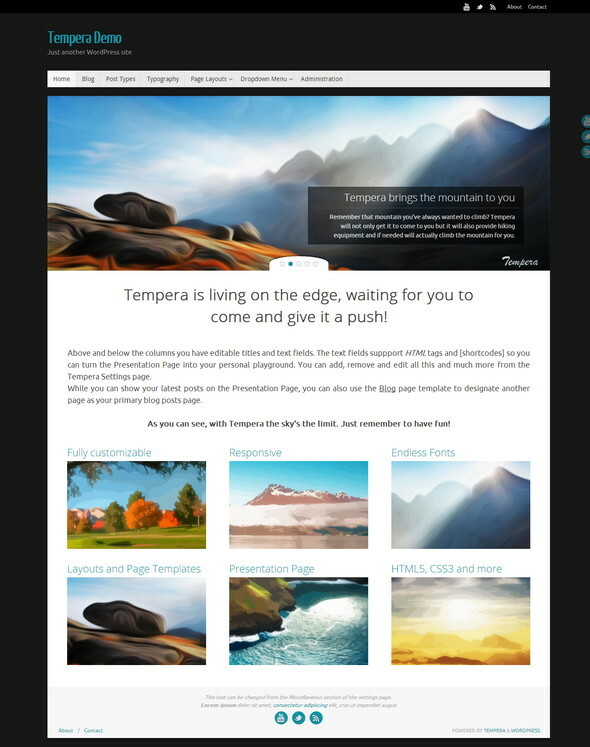 More ever it has featured slider, banner settings, logo images, portfolio and homepage custom slider. 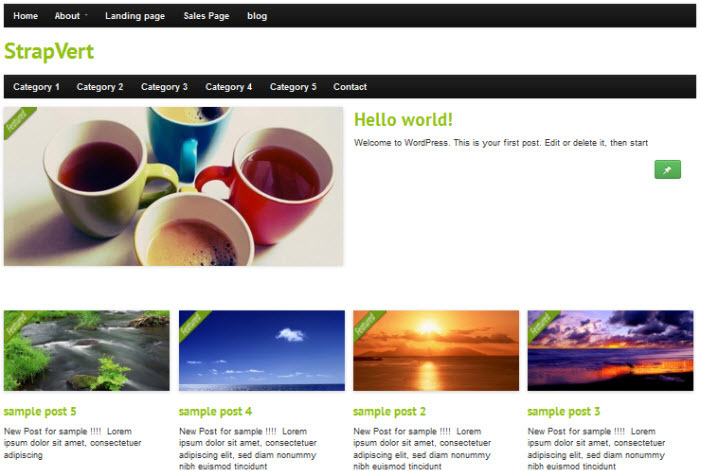 One more responsive wordpress theme, having great features. 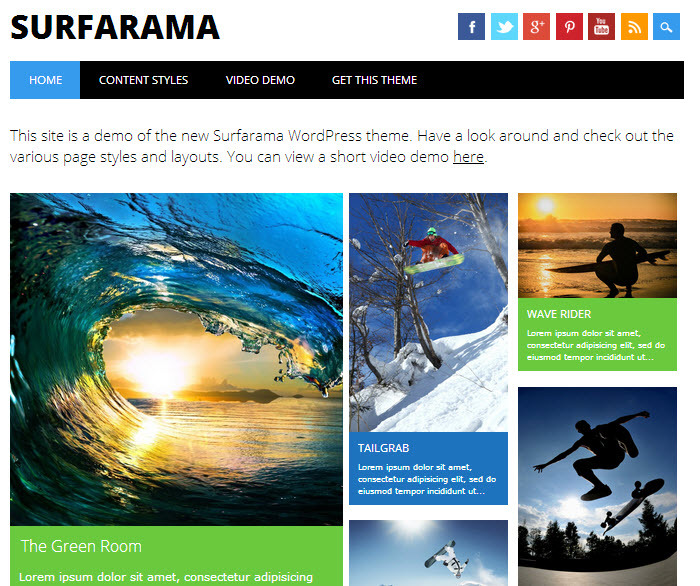 Surfarama is a bold and fun theme which includes modern mason style layout, social icons, unique for travel and magazine style websites, highly customizable, we can use a custom logo, background, primary theme color without any coding. 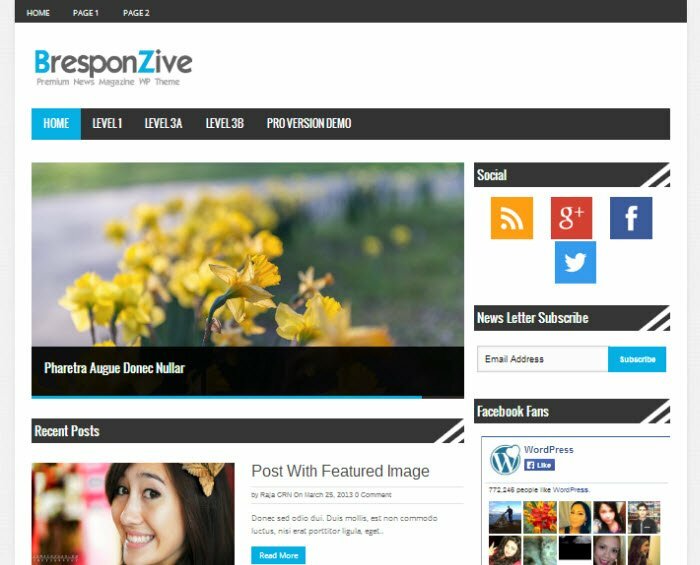 BresponZive is a free premium featured magazine/blog style layout. It comes with a fully responsive layout, 2 columns, social icons, an advanced framework that includes advanced features and functions, this theme can be used in 3 different styles and also we can customize it as we need. 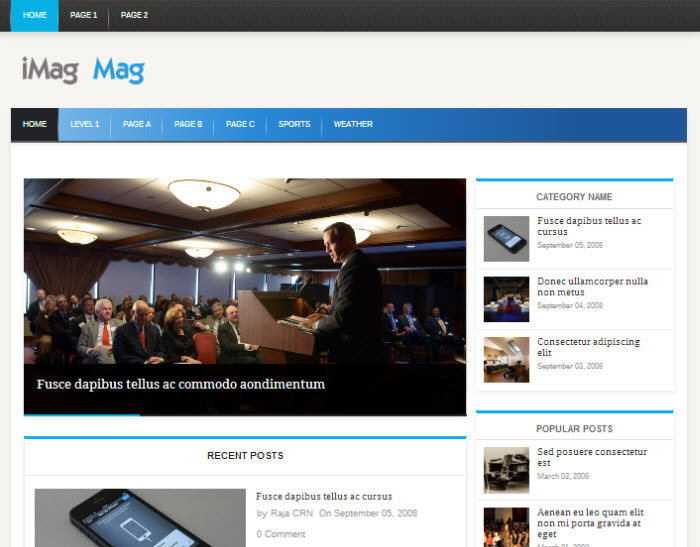 iMag Mag, is a free premium magazine style wordpress layout. iMag Mag is fully responsive, highly customize-able, 4 footer columns, the ability to add unlimited widgets in footer column, widgetized sidebar, unique color schemes and many more features that make iMag Mag perfect. 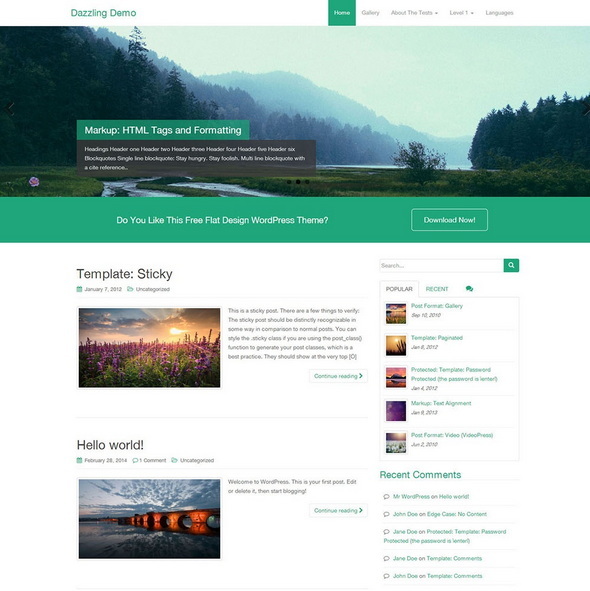 StrapVert is a clean and elegant theme, Ads ready, soft color schemes, showcase content template, custom site logo, header social icons, features posts control, footer showcase and you can show social links in the sidebar. 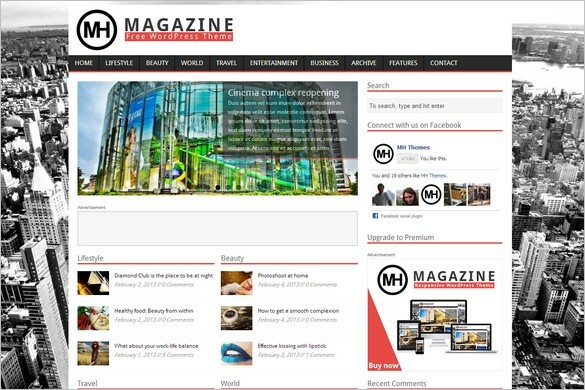 MH Magazine is another clean, modern magazine style news/blog wordpress template for online news sites, blogs, online magazines and editorial type websites. We are limited to customize this template because of free version, but if we want fully customize it, we need to buy a pro version from developers. threaded comments, built in widgets and many more features. 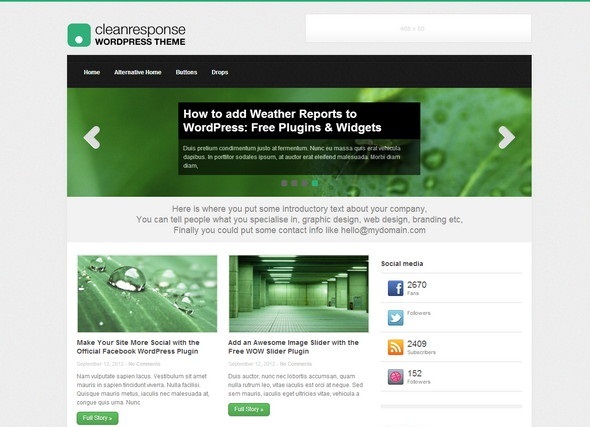 I hope this collection of best free responsive WordPress themes will help you to find your blog layout. I will like to hear your thoughts about this collection, please write in the comments section and don’t forget to share with your friends.